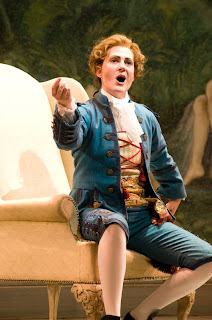 One fifth character to consider before tomorrow's opening night of Le nozze di Figaro, and that's Cherubino, every opera-goer's favorite hyper-sexed teenage androgyne. (Right, Daniela Sindram, who makes her debut tomorrow night.) Cherubino gets a little less stage time than the two principal couples, the Count and Countess, Figaro and Susanna; but his comical charm really becomes iconic for the effect of the entire opera. He is libido, pure and simple. But there's nothing dark or the least bit PG-rated about it. In his adorably bumbling awkwardness Cherubino, that little Cupid cherub of love, stands for the irrational force pulling Susanna and Figaro, the Count and the Countess all towards one another. He could grow up to become any of them; he's in love with both ladies and ends up kissing the Count (the only kiss in the stage directions and music) and mysteriously transforming into Figaro while diving out the window. The only guarantee with Cherubino is that no matter what it is, he'll never, ever get it right. Then, the song-within-a-song of "Voi che sapete." The idea here is that Cherubino, a little Mozart and Da Ponte in-training along with all his other responsibilities, has written a love song according to the conceits of traditional (probably Petrarchan) Italian verse; music teacher Don Basilio knows about the song and Susanna accompanies him when she forces him to sing it for the Countess. This aria is the only moment in the opera in which Cherubino isn't ridiculous -- here he is graceful, elegant, eloquent, and beautiful. Will he grow up to be Mozart and Da Ponte? Or, were these two great artists and oddballs musing on art's power to find, even in the most absurd of men, something beautiful?